The most southern skiing station in Europe, the Sierra Nevada in Granada, is slowly getting covered in snow. This popular ski resort, situated only 120 km from the sunny Malaga and the Costa del Sol, is preparing to open by the end of this month November. 27th of November is the date initially chosen date, which can vary of course slightly depending on the current weather and snow conditions. Skiing and snow lovers will find this winter season several new facilities. 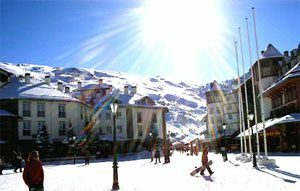 The ski resort of Sierra Nevada will inaugurate this winter season 2010/2011 the Sulayr super park devoted to enthusiasts of snowboarding and freestyle, in Loma de Dilar area, which is conceived as a young and funny space with its own image. This new snow park, larger than the previous one, will have three areas of natural and artificial modules, ambient music and Wi-Fi network, among others. Thus, the perimeter which was previously occupied by Sulayr in Borreguiles becomes part of the family and beginners ski area. This reorganization of the Sierra Nevada ski area is seeking to provide better scenarios for two basic sectors: the families and snowboarders. Another great innovation of the 2010/11 season is the inauguration of the slope Universiade. For the design of this slope it has been necessary to build an underground crossing at its intersection with the slope Maribel. The concept behind this project is to reinforce the development of competitions along with the commercial exploitation of the station, as with the underground crossing it won´t be necessary to suspend the passage of skiers from Borreguiles and Pradollano when Super G competitions are celebrated on the slope Universiade. In addition, this year has been introduced the pre-sale of discounted ski passes. Sierra Nevada is situated only 120 km from Malaga and the Costa del Sol and offers visitors a wide range of hotels and apartments.